When you experience chronic pain, it changes how you are. It affects your life on so many levels. When I had chronic lower back pain and sciatica, I stopped doing a lot of things I used to do because I was worried that they would make the pain worse. I’d not make plans or cancel ones I had made because of my pain. I felt that the changes I made to my behaviour were just me being respectful of my body and because I accepted my pain. But now, with a better understanding of persistent pain, I can see that these behaviours came about because of my fear of making the pain worse and the thoughts and beliefs I had about pain. In this article, I’m going to explore the fear of movement and how it relates to chronic pain, as part of the fear-avoidance model. Kori et al (1990) coined the term ‘kinesiophobia’ to relate to the fear of movement in relation to chronic pain. As we know, phobias are irrational fears that can be very debilitating and kinesiophobia is no different. It is the irrational fear that physical movement or activity will make the pain worse or lead to reinjury. It is debilitating because the fear stops you from doing the things you enjoy in life, which often leads to depression and increased pain. The cycle involved in this process is laid out clearly in the cognitive behavioural fear-avoidance model which was suggested by Vlaeyen et al (1995a). Below is a diagram of this model. The diagram shows the steps that occur when fear of movement is involved and when it is not. As you can see in the diagram, someone experiences pain, possibly as a result of injury but not necessarily. If that person starts to have catastrophising thoughts about their pain, for example, what will happen if they carry out an activity, they start to develop fear surrounding the pain, in particular, fear of movement or reinjury. This fear leads to them developing avoidance behaviours so they will start avoiding activities that might cause pain. In some cases, they might still do activities such as walking to the shop but develop guarding behaviours to minimise the chance of pain occurring. They become hypervigilant about their bodies and what they are experiencing, to the point where they are almost on the lookout for pain all the time. Because the muscles and joints aren’t being worked, everything becomes stiffer, less flexible and underused, which can increase disability. Due to the reduction of activity and not being able to do the things they enjoy in life, they start suffering from depression. All of this combined leads to an increase in pain. And the cycle repeats. This vicious cycle really isn’t a good place to be. 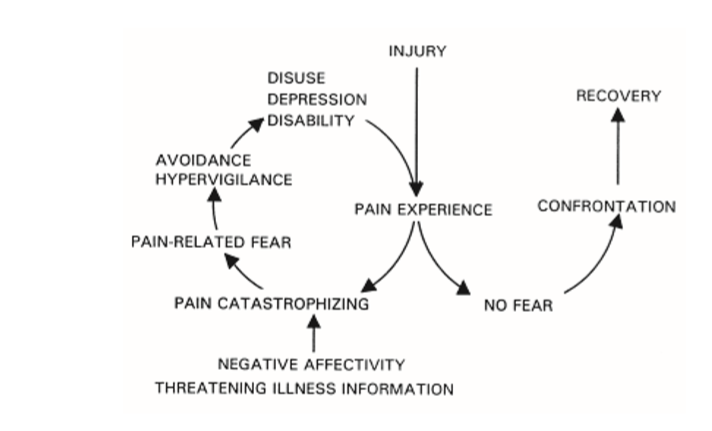 The behaviours that result in this cycle become disproportionate to our actual pain and it can lead to an exaggerated perception of pain (Philips 1987). In effect, the fear of pain becomes more disabling than the pain itself (Vlaeyen et al. 1995b). This vicious cycle really all starts with those catastrophising thoughts about the pain. Typically we assume that pain means injury but that isn’t always the case. Our interpretation of pain, our beliefs around it, and how we perceive it may all contribute to the maintenance of chronic pain. Getting your thoughts in order is so important. When there are no catastrophising thoughts, there is no fear, which allows you to partake in day to day activities and exercise helping you to recover from the pain, or at least reduce it significantly so that you have a better quality of life. A better understanding of pain. As I mentioned above, some people think that pain means damage but this is often not the case. Pain is still quite misunderstood, but the best model of pain that we have at present is that of the biopsychosocial model which acknowledges that many factors are involved in causing and maintaining pain. You can find out more about Melzack’s gate control theory of pain here which fits nicely into this model. Be aware of your thoughts. As you have seen above, catastrophising is really detrimental to your recovery from chronic pain. Building your awareness of thoughts is where it all starts. You can only start to make a change to the way you are thinking, once you become aware that you are thinking in an unhelpful way. When you spot the catastrophising thought, you can then choose to think about it differently. Perhaps ask yourself where having that thought gets you, what evidence is there for and against it, and what would be a better way of looking at it. Imaginal exposure. Spend some time imagining walking to the bus stop or climbing the stairs. Not all the worse case scenarios of being in excruciating pain, nor you being completely pain-free, but a more realistic representation of what happens. Imagine it as if you are actually there. It’s important that you are nicely relaxed while you do this. Notice the discomfort (discomfort in terms of stress, worry, and fear) that you’re experiencing as you imagine it, how it plateaus and then starts to diminish the more you imagine the scenario. These top tips can help you feel less scared about doing physical activities and exercise. I’ll tell you now, that it’s not easy to stop being fearful of pain occurring. Nobody wants to be in pain and as such, we’ll do anything we can to avoid it. 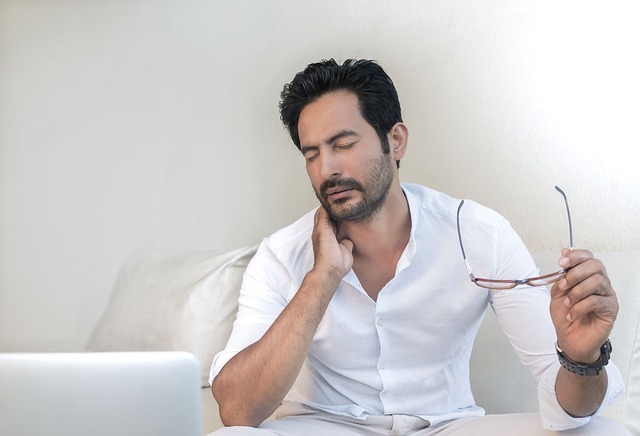 The avoidance that comes about when you’ve had pain for a prolonged period of time, might help in the short term but causes a lot of problems long term. Hypnotherapy can help support you in getting your thoughts and beliefs in order so that you feel less fearful and manage your pain better. When I work with clients who have chronic pain, we delve deeper into the tips I’ve given above and explore other avenues too. I help you to identify negative thinking errors about your pain, in particular, catastrophising thoughts. I’ll teach you how to dispute the thoughts and beliefs that you hold about physical activity, among other things, and reconstruct them into something more positive that brings down your anxiety and fear. Imaginal exposure and desensitisation now form a big part of the work I do with persistent pain clients because the vast majority of them have some element of fear relating to their pain. I will also teach you methods of relaxing, distraction, and ways to move your focus away from the pain. Hypnosis has some pretty impressive application in the area of pain control so we’ll cover some of these techniques too. Our aim is to give you back control of your life, rather than it being controlled by the pain. Crombez G, Eccleston C, Vlaeyen JW, Vansteenwegen D, Lysens R and Eelen P. 2002. Exposure to physical movements in low back pain patients: restricted effects of generalization. Health Psychol 21, 573-578. Kori S, Miller R and Todd D. 1990. Kinesiophobia: a new view of chronic pain behavior. Pain management Jan/Feb, 35-43. Philips HC. 1987. Avoidance behaviour and its role in sustaining chronic pain. Behav Res Ther 25, 273-279. Trost Z, France CR and Thomas JS. 2008. Exposure to movement in chronic back pain: evidence of successful generalization across a reaching task. Pain 137, 26-33. Vlaeyen JW, Kole-Snijders AM, Boeren RG and van Eek H. 1995a. Fear of movement/(re)injury in chronic low back pain and its relation to behavioral performance. Pain 62, 363-372. Vlaeyen JW, Kole-Snijders AM, Rooteveel A, Ruesink R and Heuts PH. 1995b. The role of fear of movement/(re)injury in pain disability. J Occup Rehabil 5, 235-252. Woods, M. P., & Asmundson, G. J. G. (2008). Evaluating the efficacy of graded in vivo exposure for the treatment of fear in patients with chronic back pain: A randomized controlled clinical trial. Pain, 136(3), 271–280.